A new visa comes into force in Australia with effect from March 18th. It contains additional requirements, which would be tough for many foreign students in Australia. 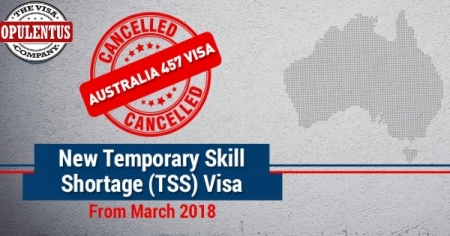 Legislation replacing the older version has been done and the new visa program is named as Temporary Skill Shortage Visa. The Migration Legislation Amendment underlines several Regulations and Reforms and the 457 visa has been repealed. It has been replaced with Subclass 482 visa. This visa enables provides an access to the employers. They can avail the services of skilled foreign workers when they cannot find skilled workers locally. At present, this new visa has the short term streams and the medium term stream. It mandates the candidates to have sufficient work experience. There are strict requirements in the English language for a long-term visa. The Applicants must obtain a skill assessment, which is positive, prior to applying for this visa. Some Experts feel that several international students, who earlier succeeded in obtaining employer-sponsored visas after completion of their course, would find it hard to obtain the fresh visa, because of the additional requirements. It will be tough for the global students to possess an applicable two-year experience as well as obtain a positive assessment of skills. As per the present norms, the short-term visas would be issued for two years, and the medium-term visas for four years. They require a score of overall 5 and also need to score at least 5 under each head of the IELTS. There is no path to attain PR Status in the short-term stream. Owing to the alleged frauds done in the 457 Visa-Program, a major drive was conducted, by the Government in 2017. After this development, the overhauling of employer-sponsored visas was announced. This would be implemented totally in March 2018. Experts feel that the foreign applicants are better placed to benefit from this visa when compared to the onshore global students. International students, gaining eligibility for TSS, are likely to be few. The foreign applicants with sound experience and finest skills stand a good chance of approval now. Employers who wish to look for sponsoring overseas workers for shorter-terms can seek an access to the occupations on the Short-term Skilled Occupation List. Likewise, those who wish to look for sponsoring overseas workers for a medium-term (four-years), occupations can do so, on the Medium and Long-term Strategic Skills List. There is a Labour Agreement Stream in the TSS, which permits the employers, to have top skilled foreign workers, as per the labor agreement, required by the government. It also expresses the fact that a need exists for workers. It underlines the situation that this requirement cannot be done through the local market where standard programs are unavailable.